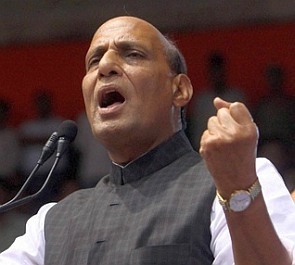 Union Home Minister Rajnath Singh on Friday stressed the need for making police stations as "temples of justice" as he advised police personnel to develop a sense of social responsibility to serve the public. "I hold the police station to be a temple of justice. This ideal will, however, materialise only when a helpless, harassed and suffering victim of injustice or crime can visit a police station without hesitation, and the police official present there listens to his suffering, and understands and empathise and also gets down to the task of prompt redress," Singh said. Addressing the passing out parade of 66th batch of IPS probationers at the Sardar Vallabhbhai Patel National Police Academy in Hyderabad, Singh said a police officer is expected to rise above any narrow or sectarian considerations in the discharge of his or her duty. "Only then can your uniform truly shine and you can become an example," he said. "Earlier the role of police force was to protect and preserve the interests of the British empire. Today your role has changed to protect common man. Now you are serving in a democratic system. It is for this reason that you work for the people and their interests and well being," Singh said. "Our Prime Minister has already said that he wants to work as a Pradhan Sevak of this country and I would appeal to all of you to develop a similar attitude to take responsibility to serve the society," he said adding that social responsibility leads to lasting solutions for many problems. "Your and our aim is to keep the country secured and also to maintain social and communal harmony. When the country and its citizens are safe then only India can become a super economic power and a super spiritual power," he said. "We not only want India to become a super economic power, but also a super spiritual power so that the country can become 'Visva Guru'," Singh added. The challenges India's police have to contend with are in many ways different from those the police in other countries face, the Union Home Minister noted. "It is therefore, the duty of the police force to thoroughly understand the socio-economic and cultural environment it has to operate in," he said adding that Indian police officials and authorities should use their sociological and psychological qualities more than merely using force in the maintenance of law and order. "Now the country has lot of expectations from you... I am confident that you will succeed in fulfilling nation's expectations," he said. Praising the role of Sardar Vallabhbhai Patel, Singh said, "It is to Sardar Patel's everlasting credit that he single-handedly achieved the merger of 562 princely states into the Indian Union with 'Minimum Violence and Maximum Willingness', and that too within a span of merely 70 days." "I feel that if Sardar Patel had not been there, Hyderabad state would not have got merged with India," he said. It is after 10 years that the passing-out-parade of IPS probationers is being held at the SVP-NPA in Hyderabad on the birth anniversary of Sardar Patel, Singh said and urged the NPA Director and its management to organise it every year on the birth anniversary of the nation's first home minister.